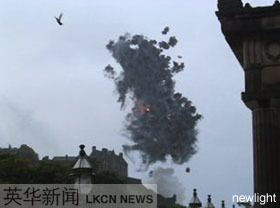 2005 Ediburgh Festival had an explosive start. Black Rainbow Explosion, a one-minute pyrotechnic display, marked the beginning of the Festival season at 7pm, 29 July. Black Rainbow was designed by a Chinese artist, Cai Guo-Qiang, who is renown for his works using fireworks and gunpower. His works include a fireworks display over MoMA (Museum of Modern Arts) in New York, a wall of gunpower to extend the Great Wall of China, and the failed attempt (caused by bad weather) to send a dragon of fire darting through central London. The Government launched a 16 week consultation of its new immigration bill. The consultation paper, named Making Migration Work for Britain, has been designed to target employers, educational institutions, prospective migrants and the public to gain their views on how the new five-tiered, point system should work. It is expected the prosposals and timetable for implementation will be announced in the Spring of 2006.